Canadian Air Force 2011 Demonstration Team CF-18 Hornet. 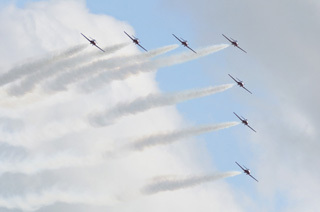 In Southwestern Ontario in the small town of St. Thomas the Great Lakes International Airshow takes place once every two years. Located and hosted at the St. Thomas Municipal Airport, a former BCATP (British Commonwealth Air Training Plan) base, it's a wonderful venue for a small town airshow with a big line-up of aircraft. Support for the airshow came from Canada and the USA. 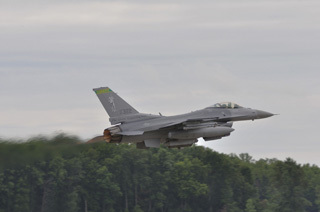 In from Tulsa, Oklahoma came four F-16 Fighting Falcons, one shown here in after-burner, left. The Canadian Forces Snowbirds Demonstration Team is always a crowd pleaser, right. Spectators from across Ontario and bordering US states make their way to the airshow to see both Canadian and US aviation acts and aircraft. Some of those attending this year included the Canadian Air Force 2011 display CF-18 Hornet, Canadian Forces Snowbirds Demonstration Team, US Navy F-5's, US F-16 Fighting Falcons (3 from Vermont and 4 from Tulsa), assorted warbirds and more. and nearing touchdown in front of the airshow crowd, right. Despite the low ceiling and rain on Saturday, the airshow went ahead with only a few relatively minor changes in the program. 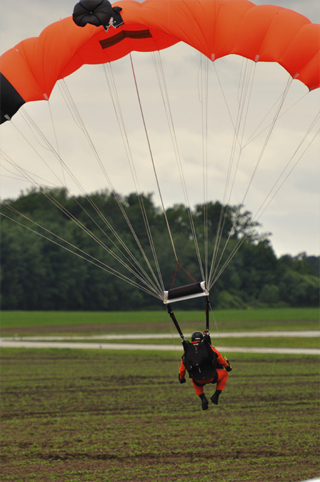 Two SAR (Search & Rescue) jumpers managed to jump from the CF CC-130 Hercules however the Canadian Forces Parachute Team, the Skyhawks, were not able to jump due to the low ceiling. As the day progressed, the weather improved enough that no other acts were cancelled, though some were modified to allow for the weather conditions. Canadian Forces CH-146 Griffon helicopter being put through its paces early in the show, left. 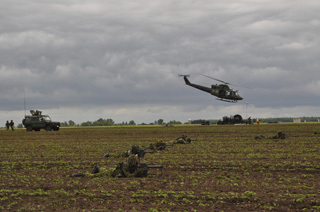 The 31st Canadian Brigade Group RCR, with support from the Griffon helicopter, in a mock combat, defence of the airport, right (Photo by Janice M. Boyd). 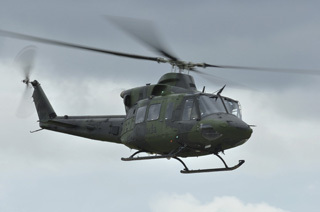 Canadian Forces CH-146 Griffon helicopter put on a nice solo demonstration and then returned with the 31st Canadian Brigade Group, RCR (Royal Canadian Regiment) in a mock combat in defence of the airfield. Operating a pair of LAV's (Light Armoured Vehicle) and a Bison Armoured Vehicle, several 'armed' troops exited the three vehicles and took up position in a fire-fight against the enemy. Support was requested and the Griffon arrived with additional troops. The enemy was repelled and the airshow resumed! One of the biggest attractions is one of only two flying Lancaster bombers left in the world, this one from the Canadian Warplane Heritage Museum, left. 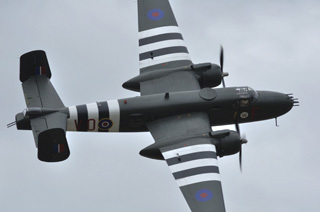 Another favourite of airshow crowds and also from CWH is their beautiful B-25J Mitchell, right. Always a highlight at airshows, Canadian Warplane Heritage flew their Avro Lancaster Mk X and their B-25J Mitchell, offering the crowd some super views of these two vintage, World War II bombers. 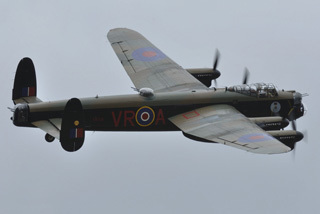 The airplanes were flown in that morning and arrived to a nasty crosswind that gave the Lanc crew a workout on arrival. However, the winds settled during their official performance and the take-offs and landings by the crews of both airplanes were uneventful. 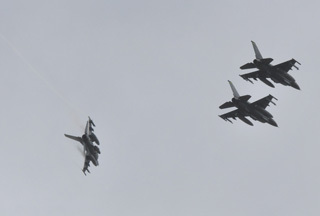 Three F-16 Fighting Falcons from Vermont break overhead the field, left. F-16 - Loud and proud, in full after-burner, right. 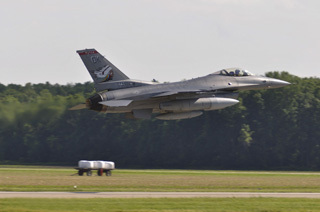 Coming in from Vermont were three F-16 Fighting Falcon's, burning up the sky with several passes by all three jet fighters. Approaching individually, gear down in landing configuration, they went to full after-burner and accelerated over the runway, climbing away for another approach. Loud! Fast! Exciting! Canadian Air Force 2011 Demonstration Hornet pilot Captain Erick O'Connor pulls the CF-18 up in a full after-burner climb on take-off, left. 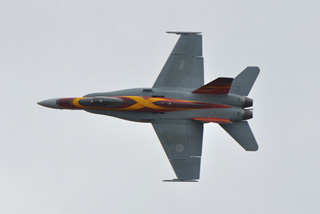 Top-side view of the paint scheme on the 2011 Demonstration Hornet, right. Not to be outdone, CF-18 2011 Demonstration pilot Captain Erick O'Connor settled into the cockpit of his Hornet and put on an equally loud, fast and exciting demonstration that started with a high "G" pull-up on take-off. Putting the Hornet through its paces, Capt. O'Connor showed the crowd what the CF-18 can do in the hands of an experienced pilot. 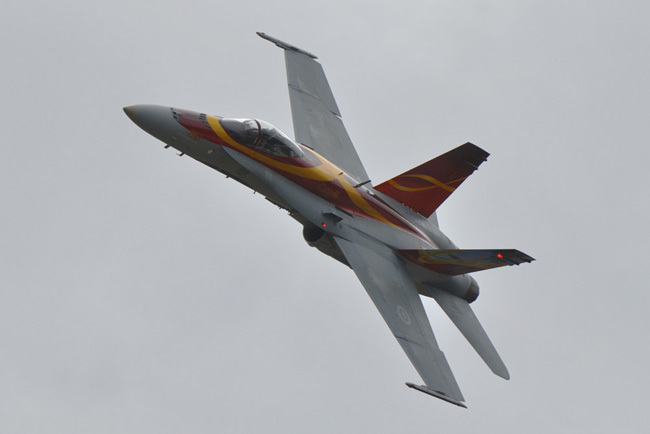 Sporting a paint scheme honouring Canadian military families, the colourful aircraft wowed the crowd when Capt. 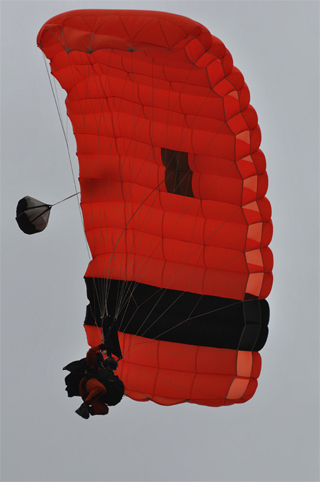 O'Connor performed an arrestor hook landing completing his performance. 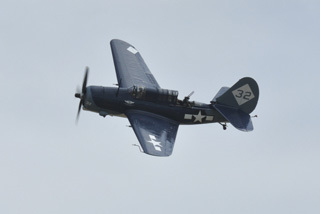 History in the air, the only flying example of a Curtiss-Wright SB2C Helldiver entertained the airshow crowd with several passes including this top-side view, left. The Helldiver on final, just over the threshold, right. Switching gears, the show turned to some history by way of the only flying example Curtiss-Wright SB2C Helldiver left in the world. The Commemorative Air Force historic aircraft took to the skies and performed several wonderful passes showing off the top and bottom sides of the airplane. 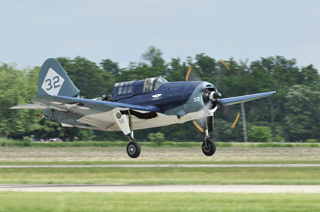 The Helldiver was fully restored in the late 1980s after an emergency landing nearly destroyed the airplane. 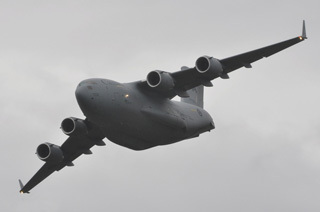 The largest transport aircraft in the Canadian Forces is the CC-177 (C-17) Globemaster III seen here in a high speed pass and turn out over the airfield in a rainy sky, left. Max performance take-off by the Globemaster III, right. 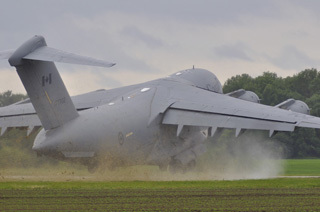 Coming in from CFB Trenton, Ontario was the CC-177 (C-17) Globemaster III. The big airplane performed a high-speed pass, turning tightly over the airfield and into a circuit for landing. This brute of an airplane touched down and stopped in a distance that would rival most Cessna 172's. The flight crew then backed the aircraft up along the runway to perform a max performance take-off, departing the circuit and airshow with a wave of the wings. 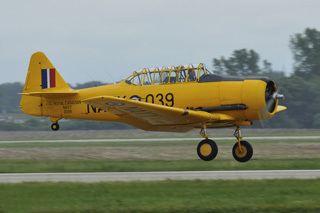 The Canadian Harvard Aircraft Association's team of Dave Hewitt, Kent Beckham and Pete Spence flew an aerobatic display in the cloudy skies. Known as "CHAT" (Canadian Harvard Aerobatic Team), the three aircraft are flung about the sky in a graceful dance in their 70 year old airplanes. 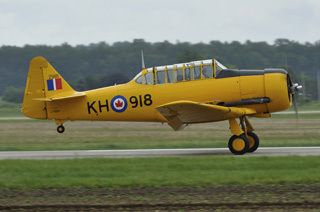 The Harvard, or T-6 Texan in the USA, was a superb training aircraft for the RCAF for many years. It flew in a variety of countries under an assortment of different names and Marks and many still fly today, worldwide. The Great Lakes International Airshow is a wonderful example of cooperation between Canada and the United States of America. It's what friendship is all about. Next week we'll return to St. Thomas for Part II and more American and Canadian airshow participation. Visit www.barnstormers.com - post an ad to be viewed by over 1,000,000 visitors per month. Over 15 years bringing more online buyers and sellers together than any other aviation marketplace. Copyright © 2007-2011 All rights reserved.